This is a reprint from an article I wrote back in 2008. I’ve took down the old site when I moved to using Joomla and rejigged the layout. I was looking through my archive of work and decided to reprint a couple of them. My greatest hobby is collecting anything to do with pioneer aviation – including airmail – okay I confess I’m also a stamp geek. Yes, I am a philatelist – and proud of it. But as an extension of my passion for early airmail stamps, I also collect all things dealing with pioneer flight. 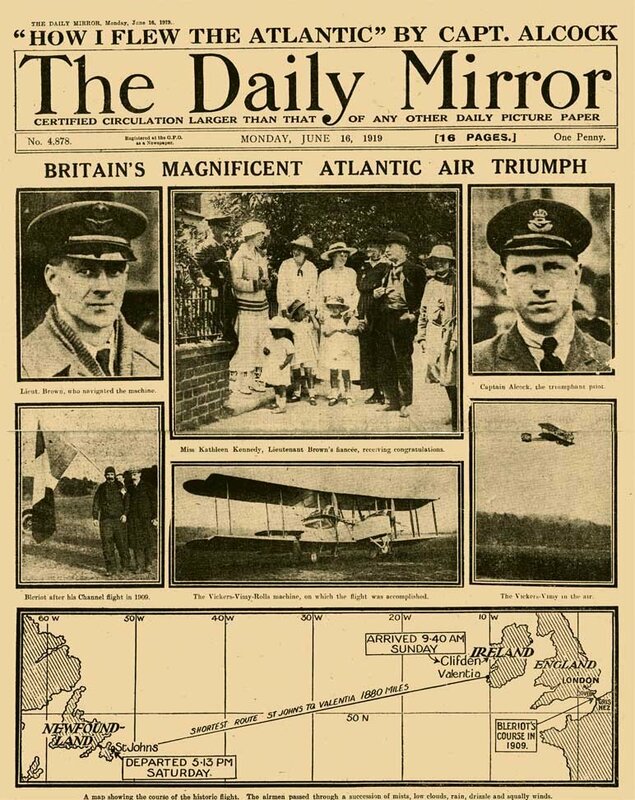 I just acquired a beautiful 1919 Daily Mirror newspaper of the famous Capt. John Alcock and Lt Arthur Brown first flight across the Atlantic Ocean. I’ll bet many of you thought the first trip across the ocean was by Lindbergh. Nope.. wasn’t – was by a pair of British Royal Flying Corp and RAF WW1 vets flying in a converted Vickers Bomber in June 1919 less than a year after the end of WW1. Lindbergh was the first SOLO flight, not the first flight, as is often and erroneously written. The trip took 16 hours and 12 minutes and had some truly terrifying moments, including one where the pilots were not entirely sure if they were flying right side up, the heating in their open cockpit plane gave out, the engine freezing over and flying as close as 20ft above the ocean. When the flight ended, Alcock was quoted “We’ve had a terrible voyage … the wonder is we are here at all”. A master of understatement wasn’t he. The flight started in St. Johns, Newfoundland June 14 and ended in June 15 in Clifton, Ireland. Actually they landed in Derrygimla Moor – a bog that looked like an inviting green field. Put this into perspective, remember this was long before radar, satellites and in this case, no ship support to pluck them out of the water if they crashed into the brink. Alcock and Brown used a sextant to check their course – yes a sextant, the same device used by sailors to check their position on the high seas. We scarcely saw the sun or the moon or the stars. For hours we saw none of them. The fog was very dense, and at times we had to descend to within 300ft of the sea. For four hours the machine was covered in a sheet of ice carried by frozen sleet; at another time the fog was so dense that my speed indicator did not work, and for a few seconds it was very alarming. We looped the loop, I do believe, and did a very steep spiral. We did some very comic ‘stunts’, for I have had no sense of horizon. The winds were favourable all the way, north-west and at times south-west. We drank coffee and ale and ate sandwiches and chocolate. I like the part of the sandwiches and ale the best. They won the Daily Mail prize for achieving the first non stop flight across the Atlantic. It was a whopping 10,000 pounds! That’s a princely sum now let alone back in 1919. I’m completely chuffed about this paper. It’s 16 pages long and has all sorts of nifty tidbits about what was going on June 1919 – including some great ads and an interesting quick note on the R 34 Blimp’s 6 1/2 hour trial night run in preparation for it’s Atlantic run. It did the Trans Atlantic run in July 1919 – starting East Fortune, Scotland to Nfdlnd, Canada and then back via Mineola, NY to Pulham, England in 183 hours and 15 minutes. The R34 later crashed on landing in 1921. The three British aviators, flying Handley-Page machine, landed for supplies at Tatoi, near Athens, on their way to London to India, via Rome. 1919 was a great year for pioneer flights. I haven’t finished reading the paper yet. I’ll post more from it later. I’ll keep diggin through my old articles and see if I can find any of the other flight related posts.